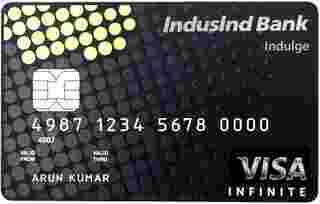 IndusInd Bank Indulge is typically available to those with excellent credit scores (650 or greater). - Your card will be a prestige symbol, with real 22-karat gold inlay reflective surface and complete black core. - You get special offers on theatre performances, art events, biennales, museum shows, and non-film events in your city. With the highest joining fee and lower reward rate, it has balanced the purpose of a super-premium credit card with all the necessary benefits and remarkable features. If you want to be an elite group of individual and want to make difference, you can try this ” Invite Only” credit card with pure 22k Gold Inlay However, you must get an opportunity by invitation from the bank to apply for the card.